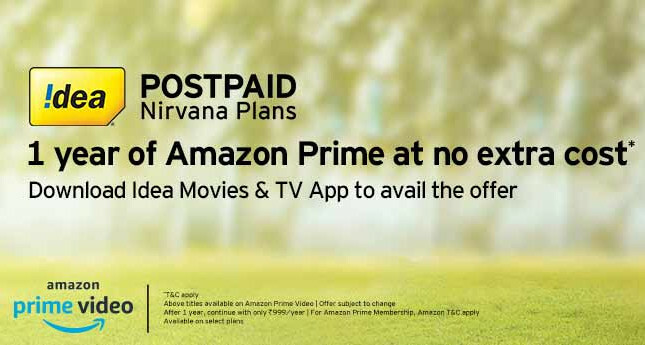 After Airtel, Vodafone and BSNL, Vodafone Idea has announced a partnership with Amazon to offer 1 year free Amazon Prime (worth INR 999) membership with Nirvana postpaid plans of Rs. 399 and above. This will offer the customers access to premium movies and TV shows on Prime Video, Amazon music, eBooks and unlimited free 1 and 2 day delivery, exclusive launches, early access to sale events and many more discounts on Amazon. Download the Idea Movies & TV app from the iOS App Store or Google Play Store. Today’s customers are digitally savvy and want more freedom and flexibility in the way they consume content. We understand the need to offer a great content experience to our consumers. Through this strategic relationship with Amazon Prime, we are further strengthening our content proposition and our commitment to offer the best to our customers. It provides them access to an extensive library of diverse and high-quality original content – thousands of movies, videos, TV shows and ad-free music on the go. We are confident that this association will provide both Vodafone and Idea customers a seamless on-the-go shopping and entertainment experience to our customers. Prime Video continues to entertain and delight customers across the length and breadth of the country. We are delighted to partner with Idea and believe that this association will further expand the reach of Prime Video to an even larger base of customers who can enjoy our Prime Originals, Blockbuster Films and other Premium content on a screen of their choice – be it their mobile device, their personal computer or the television in their living room.